linux : ..the cat came back..
I’ve just configured my monitoring machine to use a LinkUSBi 1-Wire interface and it’s a rather simple process. First of all we’ll setup One Wire File System, or OWFS for short, then we’ll add some udev rules and finally plug in a device and get some readings. Since we need to build OWFS we’re going to need a new libraries and files installed, I’m making the assumption that you already have automake, autoconf, autotools-dev, gcc, g++ installed so you can go ahead and install the libraries we need. You don’t actually have to have Python, Tcl or php5 installed if you don’t want them they add to the interfaces you can use with OWFS – unless you specifically don’t want them you may as well include them. Once the installs above have completed you’ll need to get a copy of OWFS – be sure to download the latest version of it. Update : I’ve rolled back to using 2.8p4 since 2.8p5 seems to have some problems with owserver (owfs still works fine). now we need to run the configure and make scripts. First configure, if this fails make sure you have all the dependencies required. After some churning, spewing output, cpu usage and warning messages (ignore them), which may all take 10 minutes or more depending on your cpu and memory, you should get your prompt back. Finally install owfs – do this as root. As you can see the temperature is a rather chilly 16.0625 degrees Celsius. Stuart Poulton has some 1-Wire kits available to buy for creating some domestic environment friendly temperature sensors and Quinten has some good pictures of them. Kevin has also got some newer pictures up – thanks for the headsup Kevin. Two of my colleagues are in Taipei again attending Computex 2009 this week and the news is that there appear to be a whole lot of netbooks on view. As ever Nick is uploading pictures to Picasa so you can get some idea of what’s about. As the days progress Nick will update the images, but it is a slow, slow process. Keep your eyes peeled for the rest of the week – and make sure you’re not looking at last years’ pictures by mistake ;). Some of you might notice that some things like the Asus Skype phone have been around for a little while. In fact it has been around since September of last year. Update 1: More pictures are available. Update 2: Pictures from day 3 are available now. Over the weekend I decided to take a little look at one of the latest incarnations of OSX to see what all the fuss was about. One of the real problems with OSX is that under normal circumstances you have to shell out at least 399 GBP before you even get to try it out. If you don’t like it or can’t get on with it you’re out nearly 400 big ones and who wants to risk that? There are of course ways around this and I took the plunge with a Kalyway 10.5.2 iso. My laptop is an Acer Aspire 3692 WLMI which originally came with an 80GB hard drive which I have already upgraded to a 160GB drive. Since I was only going to be testing this out I wasn’t about to erase my current linux install. I dusted off the the old 80GB drive and swapped it out with the 160GB drive and kicked off the install. 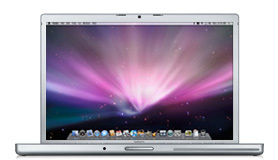 I actually did the install a couple of times to get used to how Mac people do stuff. So, a couple more changes and updates to my images. First of all I’ve taken out the Oh-puzzles because they don’t work due to this bug – once that’s sorted they’ll go back in. There’s a new little script too which allows you to switch themes. I’ve removed some of the themes that are installed by default essentially because the panel in the top right dies and never returns if you try to use them. 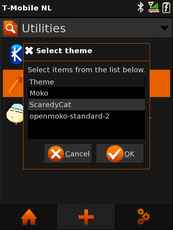 So at the moment you get to pick between Moko, ScaredyCat and the original Openmoko theme, openmoko-standard-2. By default the ScaredyCat theme is active. So, no excuses now. Get designing some killer themes. This should be a little more useful and wont fill up your flash with tiles. I’ve made quite a few changes and a couple of additions to my images of late. You may have noticed the new boot logo, the new startup sound and the new theme now there are a couple more goodies. First of all the two new applications, well one application and one script. The Bluetooth Keyboard application (really the script) is a simple shell script that hunts for bluetooth keyboards and connects to the first one it finds. If bluetooth is off it turns it on. If I can get zenity to compile properly this will be a much better script. 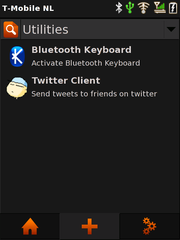 The next item is the Twitter client, GtkTwitter, It’s very basic but it works pretty well. I had to make a couple of modifications to the icons so you could actually poke them with your fingers. Next up we have a little script that starts on boot, checks to see if you have the gllin ipk ( gllin_1.0+r350-r0_fic-gta01.ipk ) in the root of your sd card. If it’s there it will automatically get installed for you – Very useful post-flash. The script will also replace the standard gllin script with the one from the tangogps site. Why? Well, because tangogps and gpsd are in the image too! Shortly, I’m hoping to provide a pre-downloaded series of tiles for download too. The good news is now you can have gps and a gps application ready for you immediately. Oh one last thing. If you create a directory on your sd card called local you can create bin and/or sbin directories and have applications run straight from there – all those little utils you need to install again after each flash now have a permanent home. Update: The bluetooth keyboard script is much more wizzy now that I’ve added Zenity to the image and use that so you can now pick the keyboard you want to connect to from the list of devices. I’ve also added some notify calls so that you can see what is going on during the script.